The space is set within a typical Tel Avivian apartment building from the late 50s in the city center. The apartment was acquired by the duo architects and designers Motti Rauchwerger and Hadar Menkes. The renovation was planned and executed by them. The previous layout of the apartment included an elongated rectangle living room that ended at a large window overlooking a tree lined street. The kitchen, the bathroom and two small bedrooms were connected by a dark corridor. The new layout transformed the corridor and merged the typical service terrace with the master bedroom to enlarge the space. The ceiling storage spaces above the corridor and the bathrooms were removed, gaining back the original generous ceiling height. By minimizing the bathroom, the kitchen space could be maximized and opened up to connect with the living space. The millwork unit acts as a partition and a living room 'facade' on one hand, and as the main multi purpose storage space of the apt on the other: kitchen cabinets, bedroom closet, supply storage as well as washer-dryer closet. Every inch was accounted for. The diagonal layout of the millwork unit opened up the narrow rectangular public area of the apartment and diminished the tunnel-like feeling. 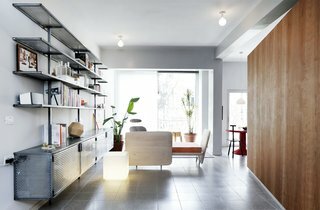 It reaches the height of the beams exposing the structure and allowing light to travel into the center of the apartment. The custom bookshelves were made of perforated steel sheets. They were positioned on the common wall between the apartment and the neighbors, serving as an acoustical barrier. Full height doors were custom designed & built by the architects to be flush with the walls. The Sofa - Shezlong (made from maple tree and velvet upholstery) was designed and built as well by the architects to serve the double sided living room. Terrazzo tiles, cherry tree carpentry, stainless steel, perforated steel. uploaded Nahmani Tel Aviv Apartment through Add A Home. Add your own project for the chance to be featured in Editor's Picks. Living room looking to the entrance. Sofa and Book shelves designed by the architects. Kitchen table, Danish design from the 70s. Bedroom entry with a custom door designed by the architects.